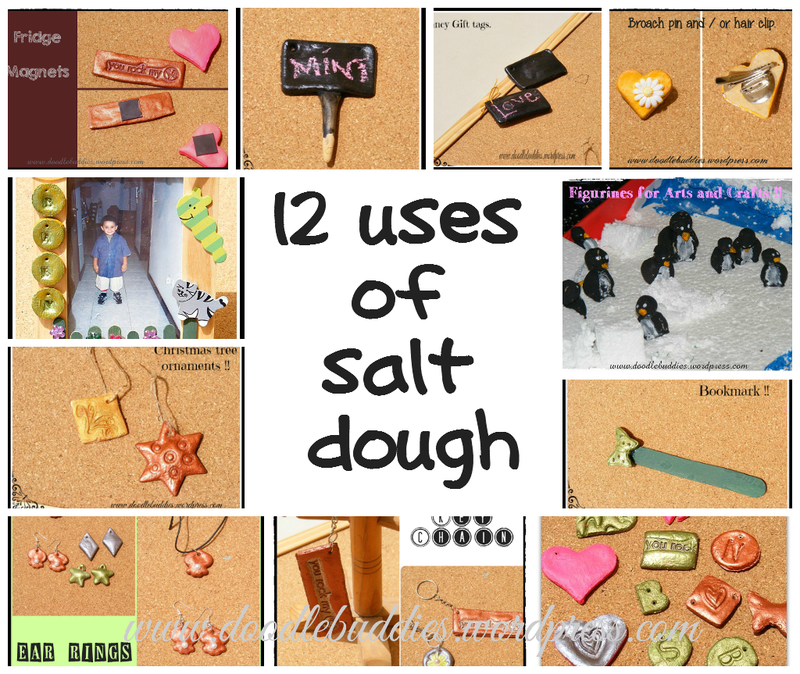 12 Ways with Salt Dough ! As the year is coming to a close, I pray, mother nature does not give us all any more, unexpected unpleasant surprises !! 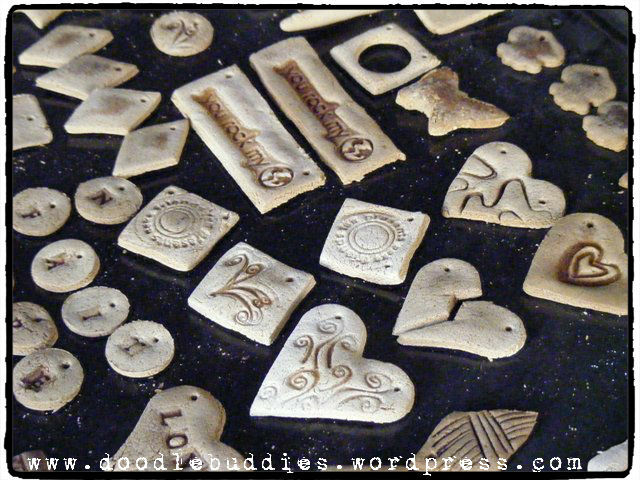 My post today is about the many ways to use Salt Dough. Salt dough and I go a long way back. When Buddy was 3, nearly 11 years back, I came across a recipe for salt-dough and got hooked to it !! I find salt-dough as the easiest and most economic way of teaching children and adults to sculpt. There are several recipes for salt dough if you google it but I prefer to keep the ingredients to the bare minimum. For my, every 4-Week- workshop, that I conduct, I always keep atleast half a class for salt dough molding and sculpturing. Salt dough can be easily mixed and very easily made. 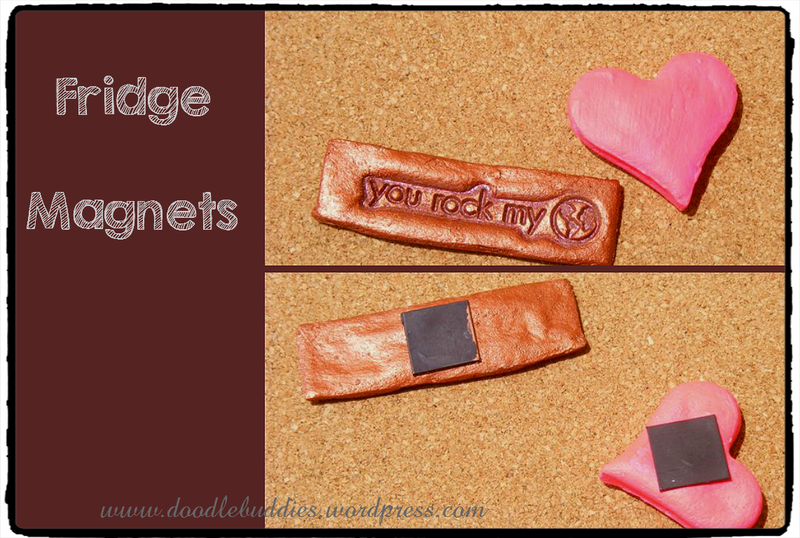 You can coat a layer of modge podge and then paint it with acrylic paints. If you want it to last longer, and don’t want the paint to fade, I suggest giving it one more coat of modge podge. Today, I am sharing with you a dozen ways in which you can use Salt Dough. 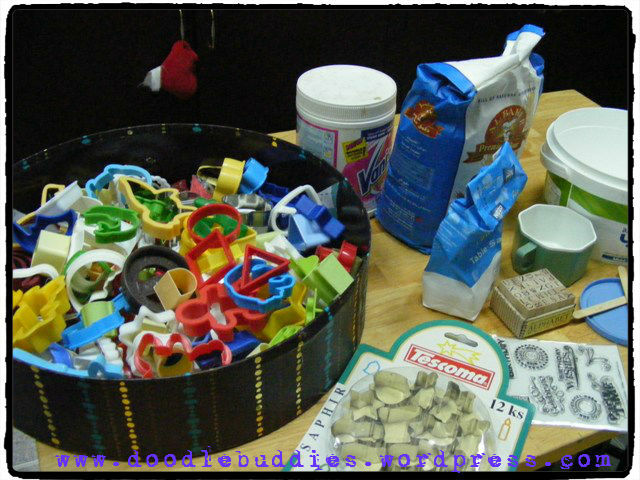 Salt Dough designs can be shaped either by cookie cutters or freely by modeling and sculpturing the dough. 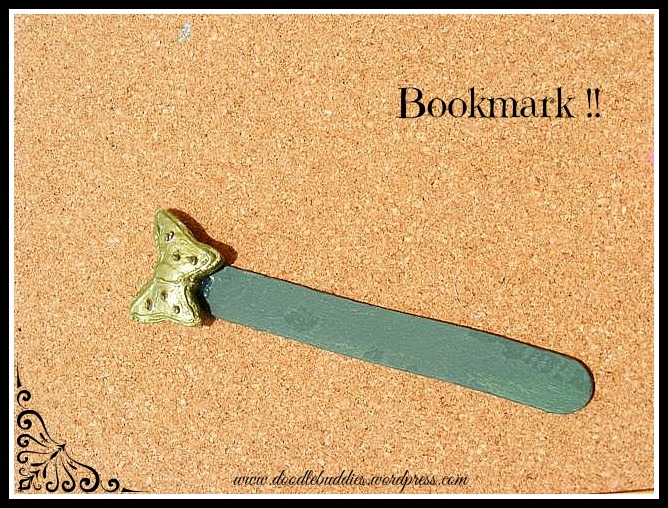 1: Bookmarks :- A simple design can be hot glued to a tongue depressor and used as a bookmark !!! Doesn’t get easier than that !! 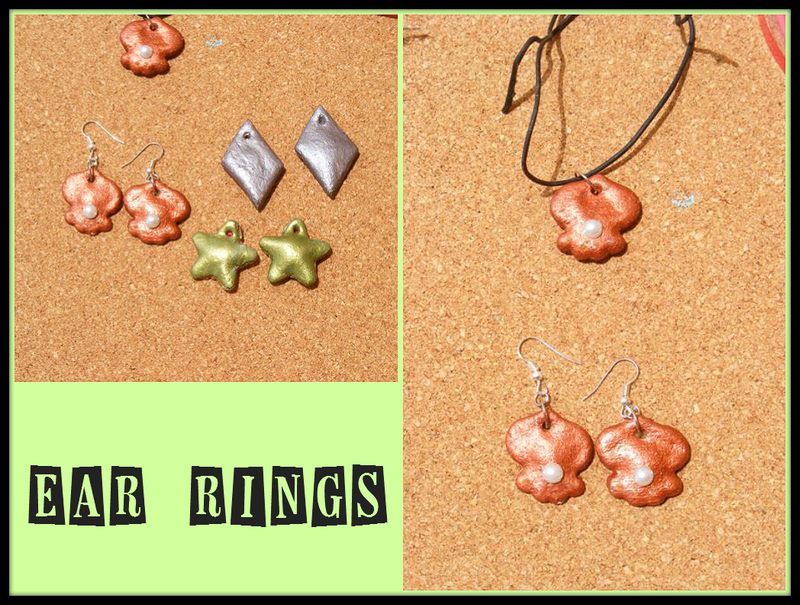 3: Ear rings :- A pair in the same shape with a tiny hole on one of the edges ~ attach a ear ring loop and you have a pair of inexpensive earing to go with every dress you own !!! 4: Pendant The same can be done for a pendant as well. 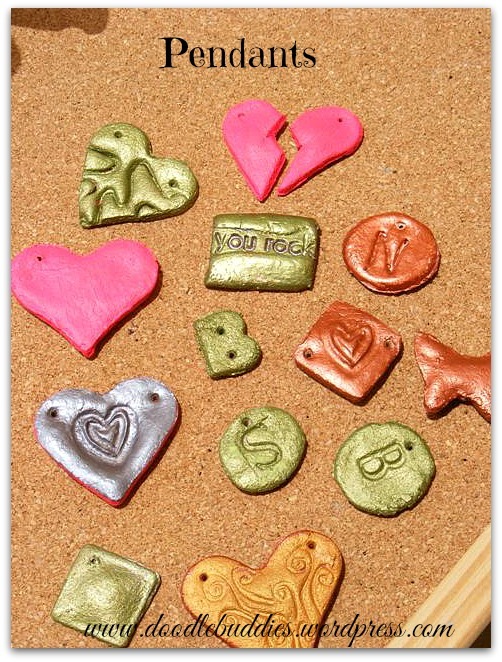 5: Hair clip :- Adding a hair clip to the base of a flower or heart shaped flat surfaced salt dough = hair clip. Ofcourse you can embellish your hair clip with pearls, glitter, beads etc. 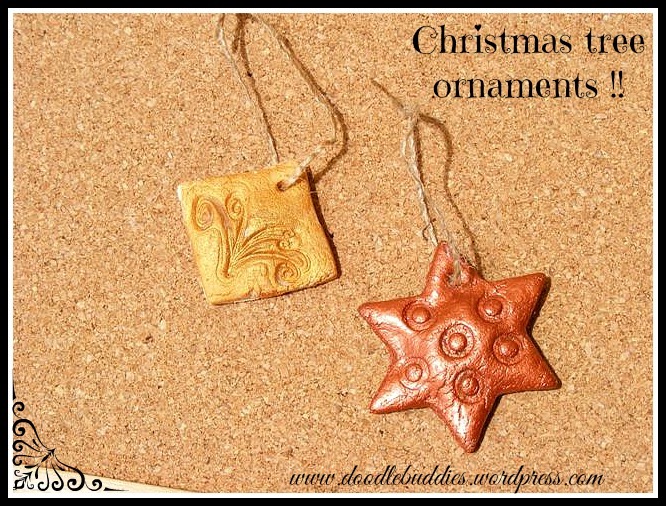 6: Christmas tree ornament :- Come Christmas and most households encourage their kids making their own ornaments for the tree. 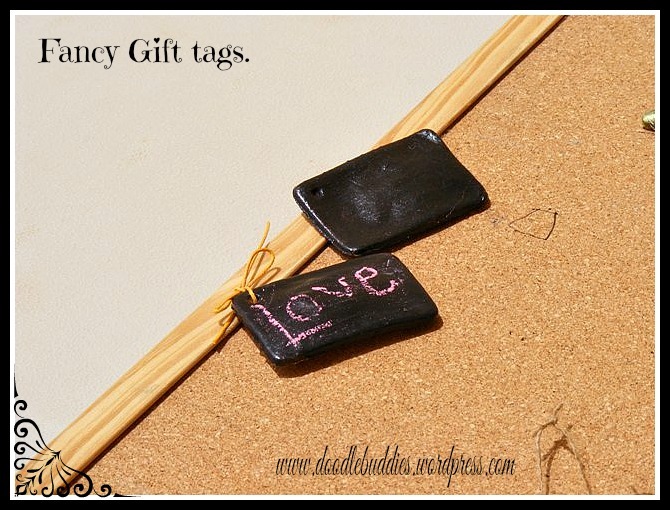 7: Fancy Gift tags:- If you want to make a dramatic statement on the precious gifts you give away ~ why not top up the wrapping with a salt dough tag ??! 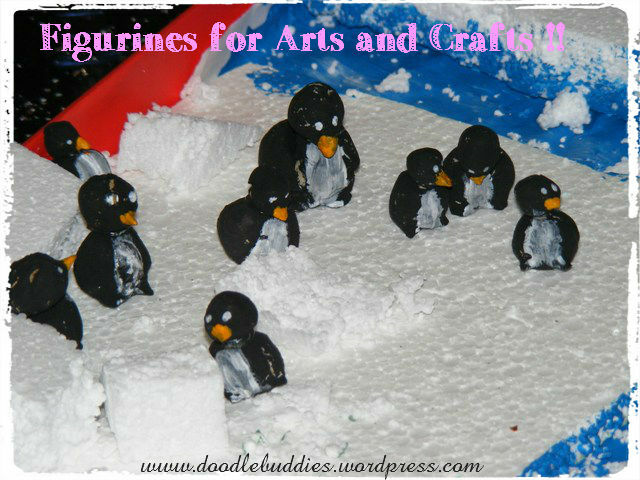 8: Figurines for art and craft OR DIY toys. Keep a small blob for every child in birthday party and see them make silly and creative critters from it ! 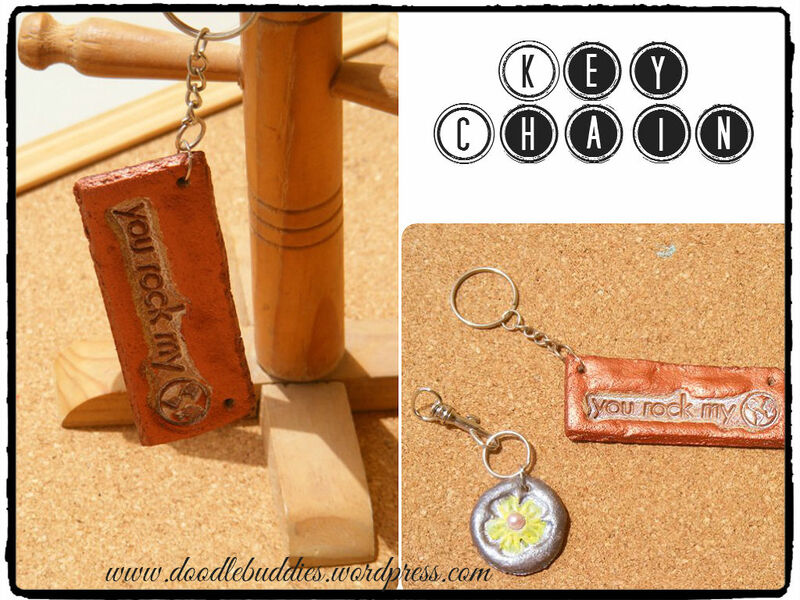 10: Key Chain :- What a lovely mothers day or fathers day or teachers day gift !! 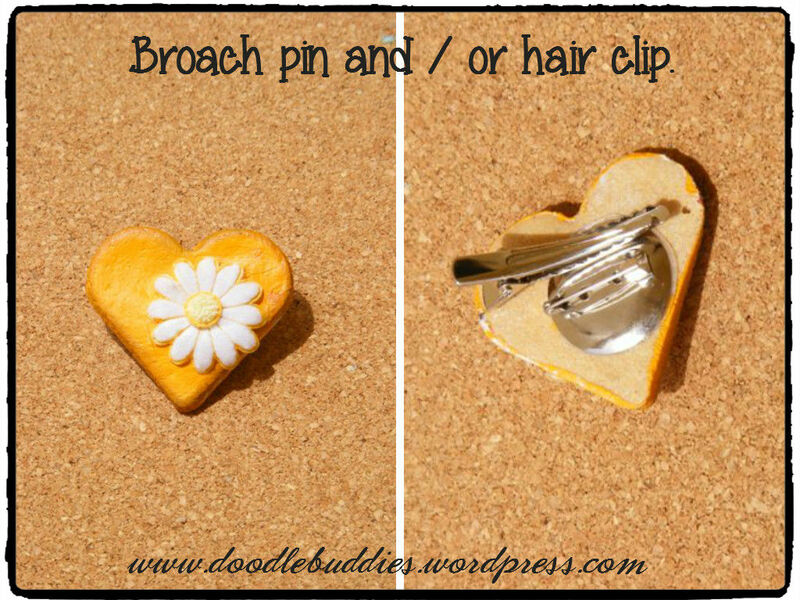 11: Broach :- the same can be made in the above manner but with a round pin clip. even table cloth weights !! I have shared more than 15 uses of salt dough but ofcourse there are many more ways to use it. 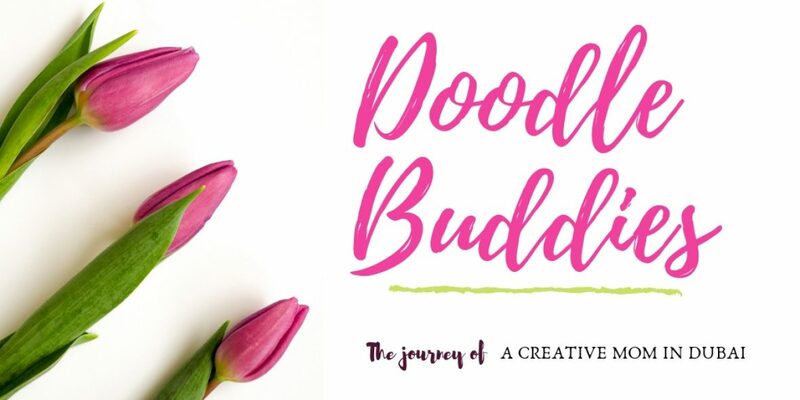 I hope you found some inspiration and would like to give it a try. 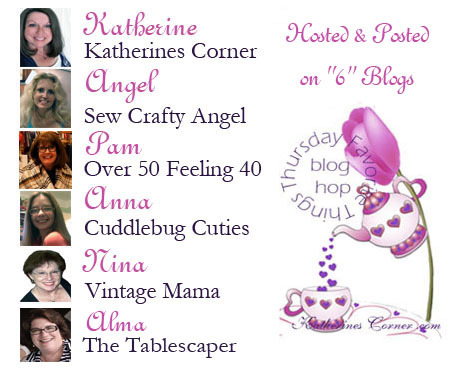 Brag About It Tuesday Linky Party here at VMG206 and also HERE at Be Betsy! Next postFamily Holidays in Dubai !! 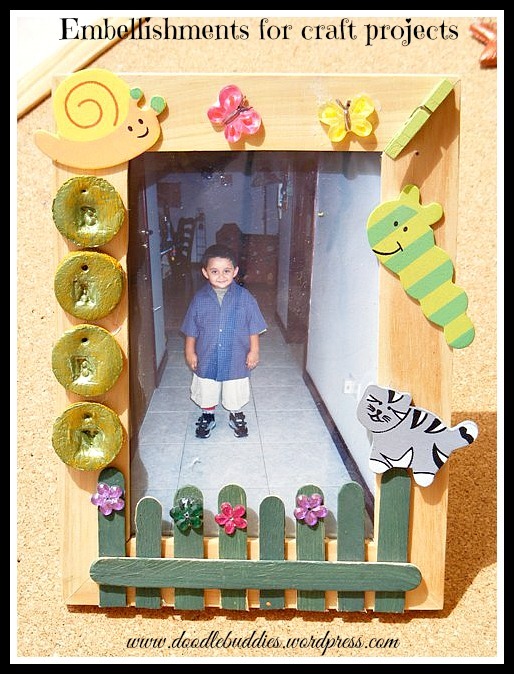 That picture frame is so cute! I never knew salt dough can be this versatile. Thanks for sharing! Thank you so much for linking to Show Me Your Plaid Monday’s! Like Ritchil, I had no idea you could do so much with salt dough! Thanks for sharing, pinned! Thank you Kristina for pinning !! Love salt dough and love all of your ideas! Thanks for showing so many options!! Wow – I never thought of all this uses for salt dough! We’ve only made ornaments. Thanks for all these great ideas! So many great ideas! Thanks for sharing! Salt dough is so easy to make and to work with. I’ve only ever made ornaments with it though. I love all of these other ideas! Thanks for sharing them. What a wonderful idea. So nice to keep the children entertained. Best wishes to you and family during the holidays. Thank you. I’ve never heard of salt dough. I will try this. Merry Christmas! I love the jewelry, and I especially love the picture frame. 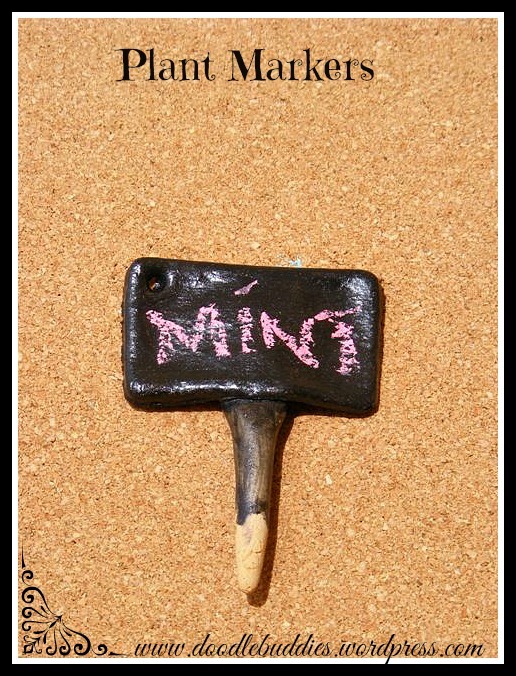 This is just so creative! Thank you for visiting me Danielle. Thanks for joining 4 seasons blog hop. It is totally new to me about salt dough. I learn a lot from here. Have a nice day. Pin. Thank you for visiting me Kenneth !